Anatomy of a Flashmob. How a policy research unit was hit. 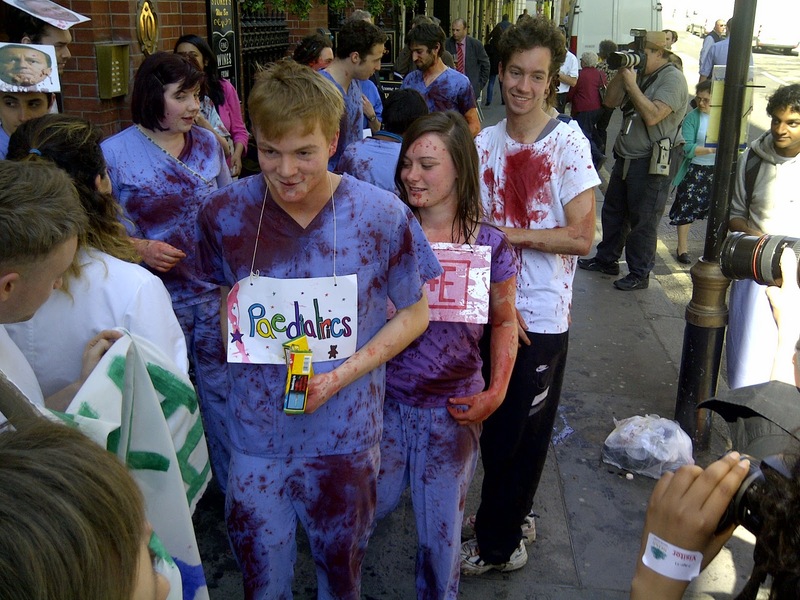 The purpose of a flashmob is to highlight a person or organisation of influence that normally works in the shadows. This enhances their influence so they have to be exposed to the light of day and held accountable. ARBOLIOTO BLOG got wind of the flashmob plan and sent an independent photographer to follow the action minute by minute as it unfolded. We would like to pay tribute to the tireless campaigners and activists who work hard (in their spare time) - for what they believe in, for no financial reward. This is an ARBOLIOTO BLOG independent investigation and we are not in contact with members of the NHS Direct Action Flashmob. Click on the pictures to enlarge. TIMELINE: HOW IT ALL HAPPENED. 12:00. All is quiet on the West End front. 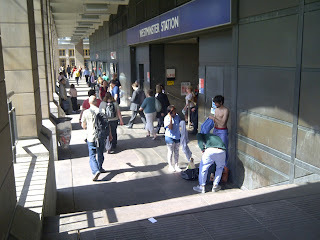 People and tourists go about their business. The only suspect in the area is our Arbolioto photographer. 12:30. 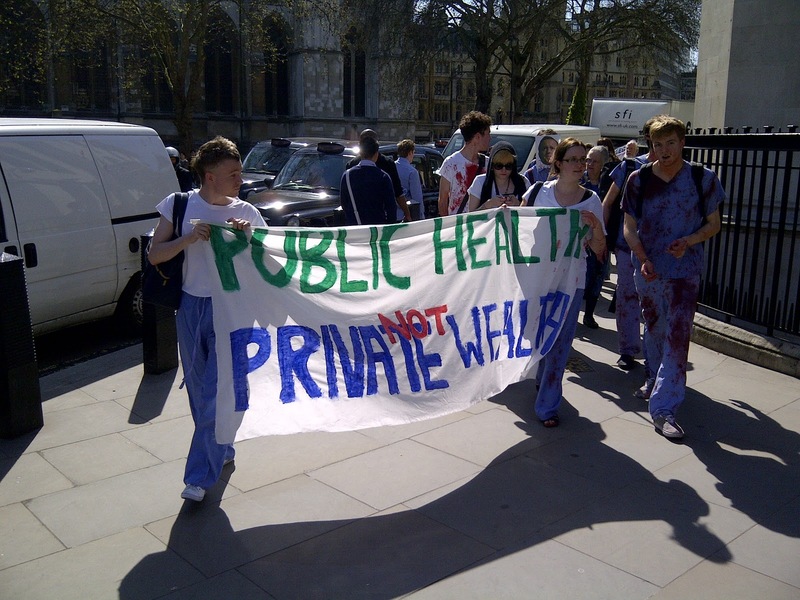 The word in the street is that a flashmob contingent of the NHS Direct Action unit is planning to hit a 'high value target' in the Parliament Square area. Who could it be? A government minister? 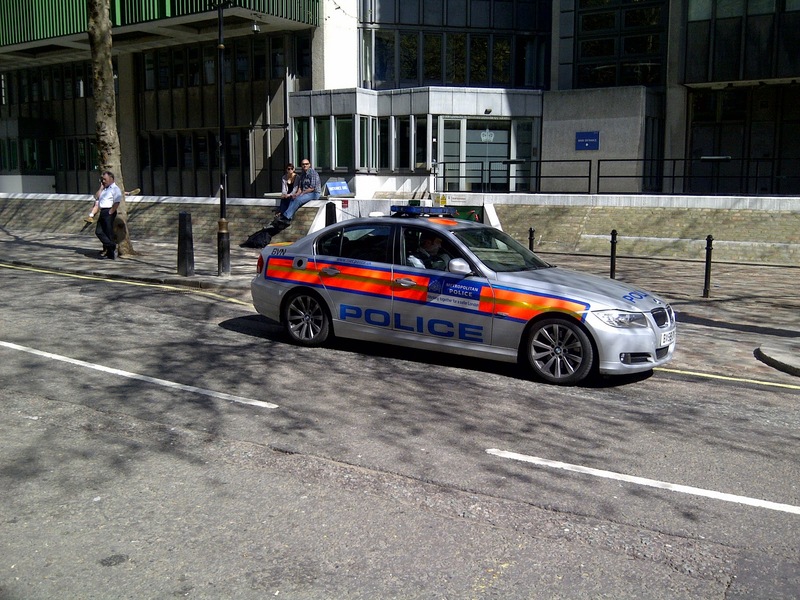 A Whitehall department? The Prime Minister himself? Members of the police are the first to make an appearance and clock our photographer who was dressed as an Easter Bunny to avoid detection. At this moment in time, everybody is a suspect. A suspect of what? That doesn't matter. But the quarrel is not with the police. 12:45. 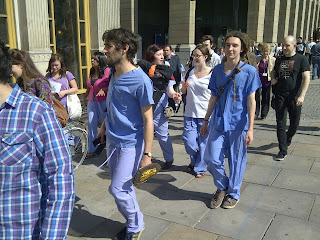 First activists make their arrival and change into urban guerilla warfare uniform: NHS regulation clothing. 12:55. A routine anti terrorist unit patrols the area. Fortunately they don't see anything unusual, apart from some people changing into NHS uniforms. 13:00. Big Ben chimes the time for the final procedures to begin. Flashmob is assembled and ready for action. All is clear. The element of surprise has not been lost. The GPS coordinates of the target will be revealed on a 'need to know' basis, just in case one of the members of the group falls into enemy hands and spills the beans. But, who is the enemy? 13:23. The Flashmob is on the move. They try to blend in with the surroundings of Parliament Square so as not to give any warning to the intended target. 13.30. Arrival. No point of disguising the target any more. 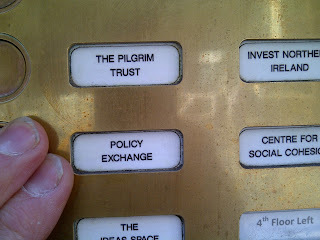 It's clear: The POLICY EXCHANGE think tank. It's a shadowy research organisation providing advice to right wing politicians and big business on how to privatise the NHS (our emphasis) and other areas of the economy. The idea is to provide rich pickings disguised as 'competition'. 13:33. This photographer does not know how the flashmob got into the building. I believe that a 'sleeper agent' invited them in when everybody at the Policy Exchange was having a 'siesta'. The idea was to keep the visit legal. 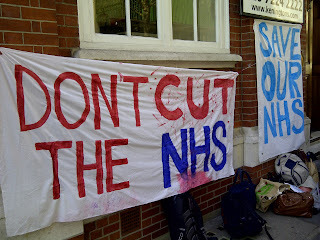 Immediately on arrival activists stage a sit-in and demand to talk to a senior official of the Policy Exchange to 'exchange ideas', so to speak, about privatisation of the NHS. 13:42:04. Instead of arranging a meeting with the party of 'concerned individuals' about the future of the NHS, members of the policy group panic and call the police. First patrol arrives very quickly. 13:42:25. Officer in charge comes out of his car and decides to investigate. He is alerted by a member of the policy unit about what is going on. The guy at the first floor window shouts "Shock, horror! We are being flashmobbed! I will press the buzzer so you can come in and arrest them all, officer". 13:43. Two more police cars arrive but by this time the flashmob was leaving the building. No need to get nasty. No arrests were made. The police preferred to keep a low profile. "It's all a bit of fun to expose a shadowy organisation, officer!" shouts one activist. The officer is unperturbed. 13:50. 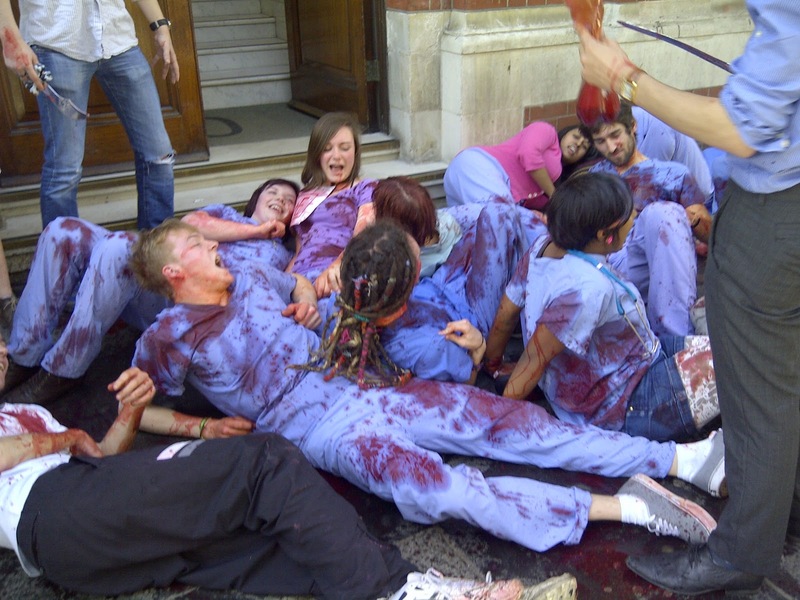 At this time the flashmob stages a mock massacre to highlight what is going to happen to the NHS and its patients if the privatistation of UK Coalition Government goes ahead. 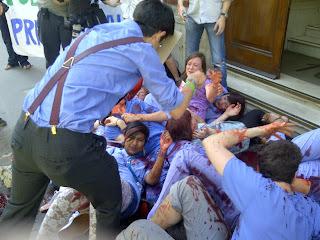 Shouting and commotion as lots of blood pours from injuries. 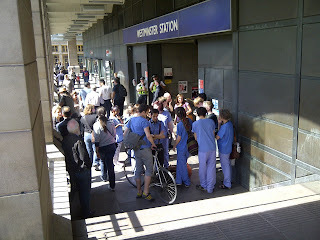 A crowd of worried onlookers surround the flashmobbers. 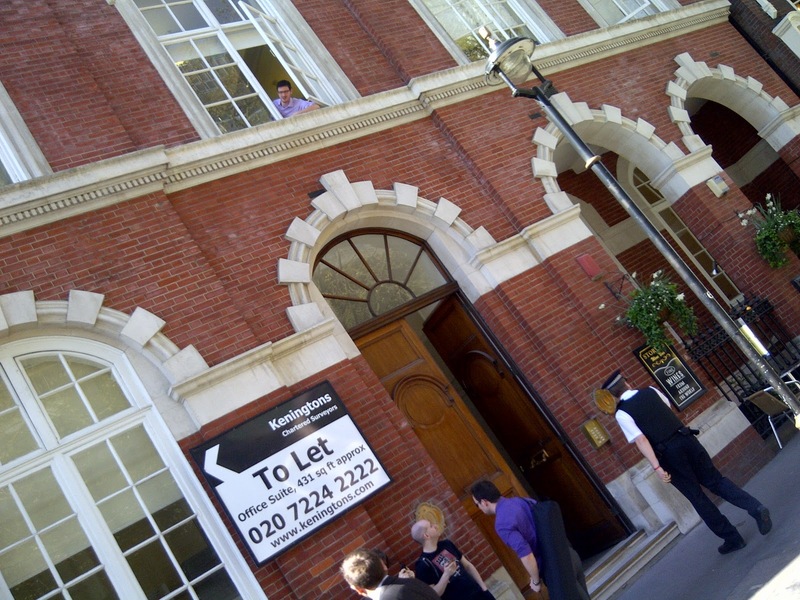 A Policy Exchange researcher peeks from the window. "Guys, look! Come and see! We've caused a massacre outside! They are not just losing their jobs. They are all dead!!!" He takes some pictures with his iPhone as record of a good day's work. Or so he thinks! 13:53. Mission accomplished. 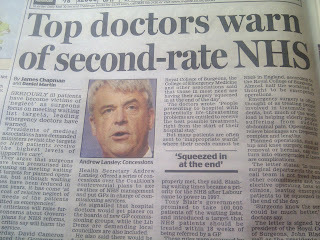 David Cameron and Andrew Lansley have slained the NHS. A flashmob has been dealt with. No experience necessary. A scene reminiscent of a James Cameron movie rather than of a David Cameron policy decision based on a Policy Exchange study. 14:00. A wounded activist picks up a megaphone and issues a warning to the Policy Exchange high command: "To all members of the Policy Exchange think tank! We have the building surrounded! Come out with your hands in the air! You will be treated humanely! You will not be sent to Guantanamo! We only want to have a civilised policy exchange conversation." But there's no answer. The Policy Exchange members prefer to stay in the shadows. 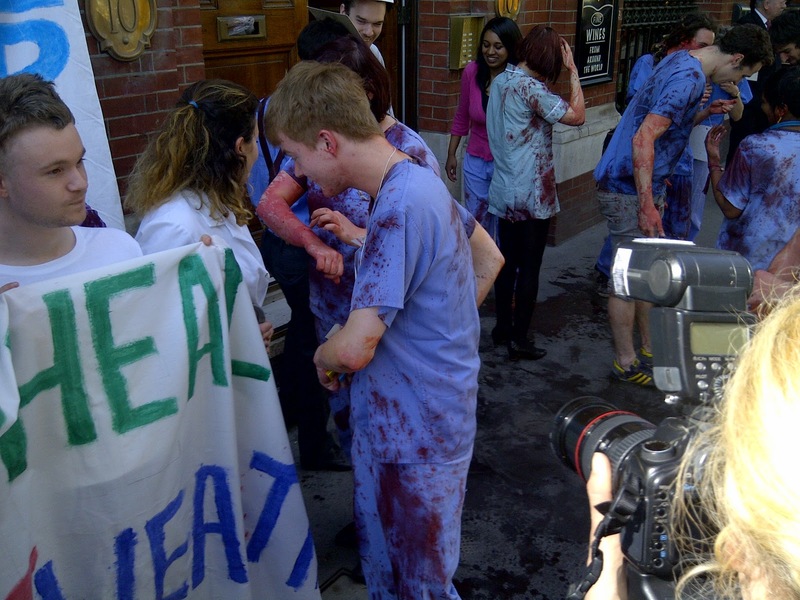 Thanks to NHS rapid action all the members of the flashmob are cured from their injuries and come back to life. The dastardly plan by privatising forces has been thwarted, for now. 14:08. On to fight another day. We wish them well. 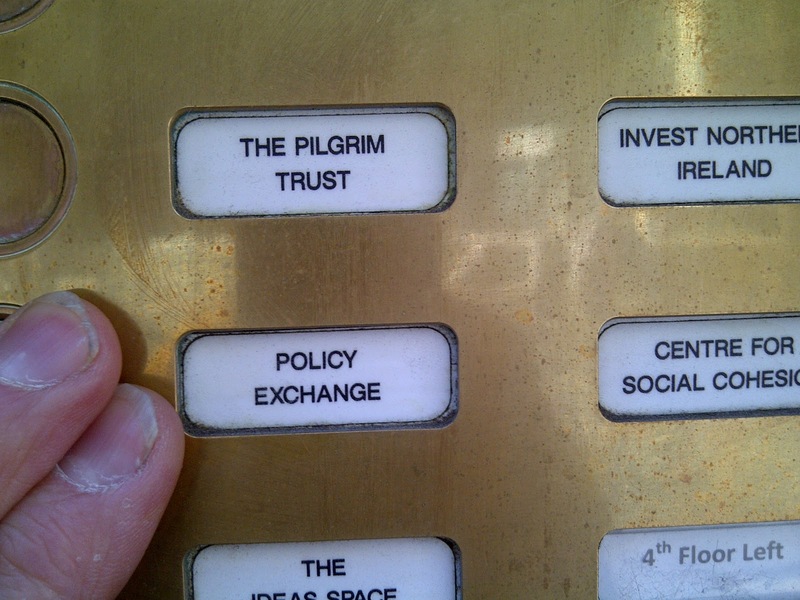 THE POLICY EXCHANGE THINK TANK. 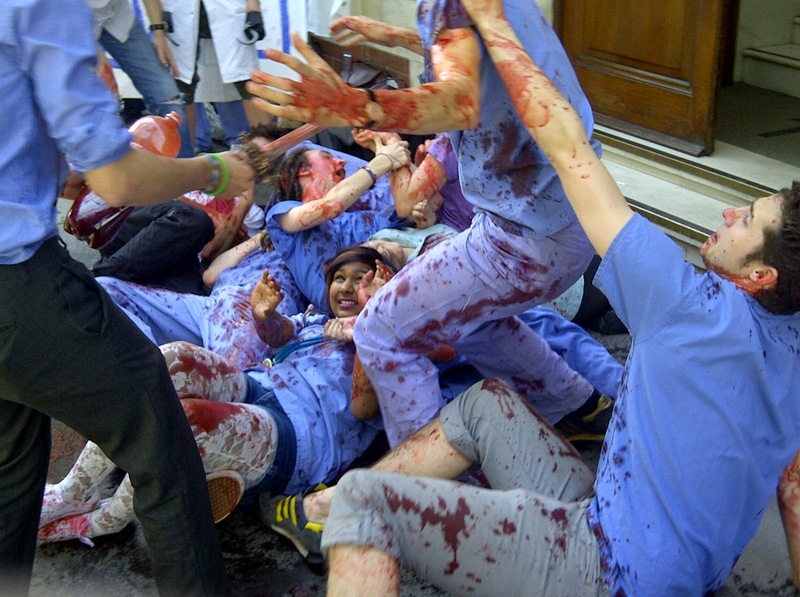 Policy Exchange was hit today by NHS activists in a flashmob manoeuvre to expose them as the kind of people who research ideas to feed into right wing politicians, banks and government officials intent on finding excuses for extreme measures. Essentially, they provide 'academic' cover for policies that normally would never see the light of day. Think tanks work in the shadows until there is some requirement for them to make a stage appearance. Washington DC is full of them with the most obscure names. 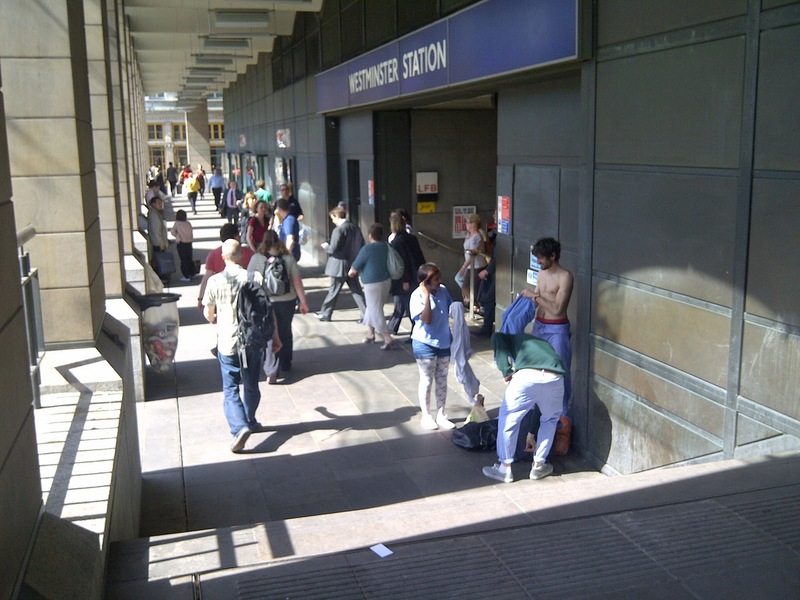 Copying the US system, London is now more prone to create them and use them. It is always an issue who funds them. Think tanks come into their own when some big privatisation or big invasion has to take place. In such opportunities they appear with an array of numbers, academic references, obscure case studies that nobody bothers to check but that serve the purpose in hand. Then they return to the shadows. Think tanks never analyse critically the hand that feeds them, like banks and big corporations. But they make sure they provide victims for them to feed on. By hitting the Policy Exchange the NHS Direct Action Flashmob is drawing attention to a very real danger. POLICY EXCHANGE - WHAT OTHERS SAY ABOUT THEM. Their website has numerous testimonials which are designed to show what kind of influence they have. DAILY TELEGRAPH: "The largest but also the most influential think tank on the right"
GEORGE OSBORNE "Policy Exchange has been a wellspring of new ideas"
OLIVER LETWIN "Policy Exchange has become one of the seminal influences on the political debate"
BORIS JOHNSON "Produces a torrent of invaluable studies which are powering the renaissance of the centre right"
MICHAEL GOVE: "A tiny band of guerillas now a formidable army"
It would be interesting to have a breakdown of who donates to their causes so we can have a better idea of where they are coming from. We would welcome Policy Exchange to volunteer information. There's none in their website. They like to call themselves 'centre right' probably because to be just 'right' will put them on a par with English Defence League and British National Party. Some people believe that for strategic reasons they promote themselves as being politically to the centre-right. However, in economic terms they are clearly in the far right. There's no area in public life about which they don't put some research document or publication. Their sphere of influence includes Arts & Culture, Crime & Justice, Economics, Environment & Energy, Foreign Policy, Government, Health & Social Care. - We are particularly interested in free market. - Completely reinventing the way government traditionally works. 18:56. Later on, our photographer was having a coffee and picked up this headline from a newspaper. None other than the Daily Mail. 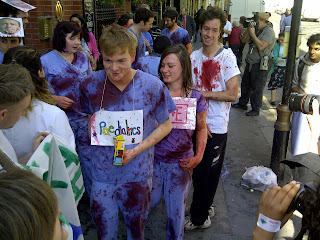 Any similarities to people living or dead if the NHS is demised will not be a coincidence. Disclaimer: We are happy to post on this blog any clarification that the Policy Exchange wishes to make public. 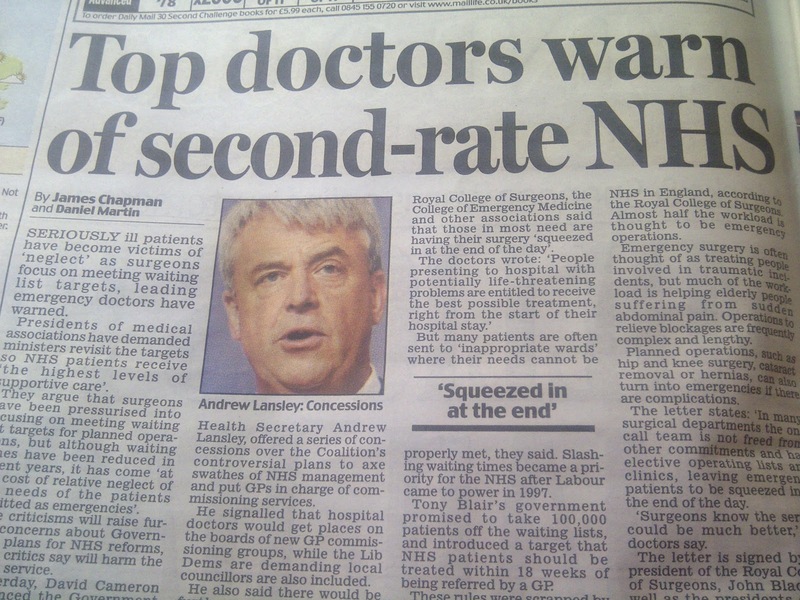 Note: NHS or National Health Service is a publicly funded healthcare system in the United Kingdom.